My first strong attempt to make sourdough bread using information from the various sites on the internet. The bread is essentially my own ground whole wheat flour, starter using wild yeast from the air, bottled water, and a bit of non-iodized salt. A cup of gluten was added when making the final dough for no apparent reason. Day 1. Whole wheat flour 120 grams and water 120 grams put in bowl mix and set at room temperature for 24 hours. Next day 2. Repeated again. Day 6. Remove two cups about 500 grams to make dough. Feed the starter again for the next batch. To slow the action store in the refrigerator. Two cups of starter about 500 grams, tablespoon of salt, 500 grams of water. Mix. Add enough flour to make dough. I added about 240 grams of gluten since I had it, but not necessary. Cover ball of dough and allow to set until about double in size. This can take up to 12 hours. Shape into two batches and place in buttered cooking pans. Allow to rise to fill pans and even overflow a bit. This can take up to 12 hours. Set oven to 400 F, time for one hour and bake. Remove from oven, cool and enjoy. Another batch of Sourdough Bread. Attempting to get more rising in the pans. 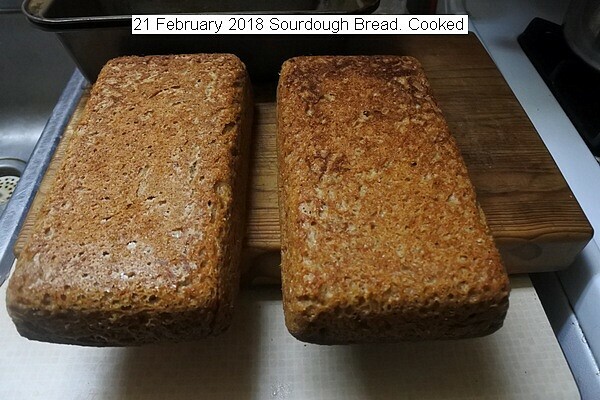 http://durgan.org/2018/February%202018/21%20February%202018%20Sourdough%20Bread/HTML/ 21 February 2018 Sourdough Bread. Still experimenting with making sourdough bread. Desire more rising in the pans. The loaves weigh about 500 grams each and are good quality. Probably a little heavy but still good flavor. 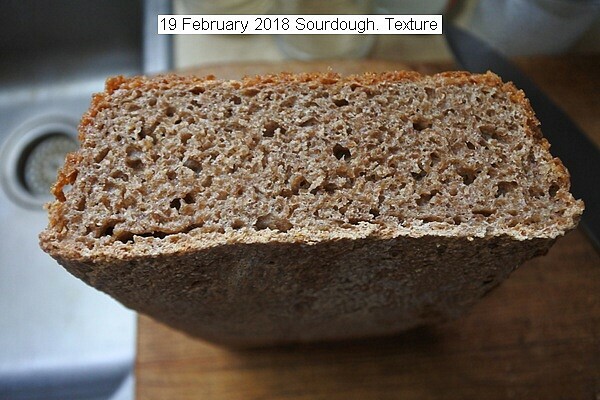 This entry was posted in Uncategorized and tagged 19 February 2018 Sourdough Bread, Sourdough Bread. Bookmark the permalink.